Videotaping a teacher's practice makes for a better debrief, more learning. 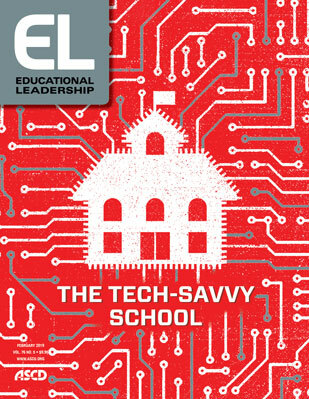 Technology has transformed the ways teachers and leaders conduct much of their work. Classrooms are filled with smartboards, audience-response systems, and tablets. We take attendance electronically, autodial parents with students' absences, and spend hours each week on email. But one area hasn't reflected this change: the process of observation, coaching, and feedback. By and large, peers, coaches, and administrators still visit classrooms, observe a colleague teaching, and schedule a time to debrief with that teacher. There are at least two problems with this. The first centers on the fact that the observation focuses more on the teaching and less on the learning. Too often, the observer attends to what the teacher is doing, documenting what the teacher says during the entire observation. The debrief conversation focuses on the teacher's instructional moves; little attention is paid to whether students learned anything. Admittedly, it's hard to focus on everything happening in the classroom when you observe. We often have to remind ourselves to "look down as often as we look up." By that, we mean that we should pay attention to the students, the tasks they're completing, and whether there is evidence of learning, rather than just looking up to see what the teacher is doing. The second problem is that the debrief tends to focus on what the observer perceived—which can be disputed by the person teaching. We've heard of administrators telling teachers things like, "You only called on students in the front of the classroom," "Several students weren't engaged," or "I liked the way you used gestures to make your point." When feedback is relayed in this way, a teacher may or may not remember the situation well enough to be able to reflect on her or his practice. Or the teacher may remember it differently or have an alternative perspective. This can devolve into a he said/she said situation in which the observer loses any ability to encourage growth. In fact, some teachers are impervious to the feedback they receive from classroom observations because they have a pre-existing "confirmation bias" about their teaching and only accept examples that confirm what they already believe. In addition, some teachers suffer from a "halo effect": They use the experiences of a few students to generalize about what's happening with all students' learning. When concrete evidence isn't part of the discussion, teaching—and learning—might not change. Worse, a teacher may think that the "expert" (the person coming to observe) knows it all—and that he or she just needs to be told how to teach. That's not an effective way to create change. One way to get past these limitations is to video-record a short segment of a teacher's practice. Not too many years ago, it would have required a Herculean effort to video-capture what goes on in a classroom. Few people had portable video equipment with high-quality sound capabilities. But now we all do! Mobile phones and tablets are excellent devices for capturing real-time learning environments. We recognize that many educators are wary of being recorded; they fear the "evidence" could be used against them. Thus, as coaches and leaders embrace the use of technology for observation and feedback, they should consult with teachers in advance and clearly outline the appropriate and inappropriate uses of such recordings. For example, in some schools, the digital files are deleted after the discussion. In others, the observer uses the teacher's technology to record so that the file is never in the observer's hands. It can also help to start by recording only teachers who volunteer and allowing others to join in over time. We call using a video clip (of a teacher giving a lesson or leading an activity) to spark discussion about that teacher's practice micro-teaching.1 We believe the day is coming when micro-teaching will be commonplace. There is strong evidence that micro-teaching works. In his 2012 research review, John Hattie collected a large number of meta-analyses, or statistical compilations of many studies on the same topic.2 His findings suggest that the average impact on learning of any instructional practice is .40 (this effect size represents a magnitude, or how strong the impact could be). Micro-teaching has an effect size of .88, more than double the average impact. Simply video-recording classrooms won't result in the impact noted in Hattie's review. Each video clip must serve as fodder for the discussion a teacher has with a colleague about what that clip reveals. Rather than an observer telling a teacher what he or she saw, the video can be used to encourage the teacher to notice particular moves he or she is making, and the impact those moves have on students' learning. You can see such a discussion in the video accompanying this column. Two math teachers at Health Sciences High and Middle College in San Diego—Heidi Allen and Joseph Assof—watch a video of Heidi teaching and discuss what they notice. Joseph is Heidi's peer coach, and vice versa. They work together to improve outcomes for both their students; sometimes Heidi observes and records Joseph and other times he records her. Note that during their discussion, Joseph uses skills in cognitive coaching and reflective teaching to ensure that he doesn't tell Heidi what he thinks about the lesson, but rather thinks with her about what they observe. Both teachers ask reflective questions as they watch the clip. They ponder the impact of specific moves and note things Heidi could have done that might have led to increased learning. Consistent with a micro-teaching approach, they focus on short segments of the video, dissecting instructional moves and students' responses to those moves. In other words, they don't limit their conversation to teaching; learning is also important. The quest for better learning need not be limited to developing instructional strategies and tools. We can also use micro-teaching to foster honest, reflective conversations about what is being taught and learned in a classroom. Many of these evidence-based conversations won't be easy. But they will be consequential, impacting both a teacher's teaching and a students' learning. Watch two colleagues discuss a videoclip of one of them teaching a lesson. 1 Shaw, D. (2017). Accomplished teaching: Using video recorded micro-teaching discourse to build candidate teaching competencies. Journal of Interactive Learning Research, 28(2), 161–180. 2 Hattie, J. (2012). Visible learning for teachers: Maximizing impact on learning. New York: Routledge.